Chocolate is one of those foods that can be incredibly good for your health and bad for you at the same time. Eating too much chocolate can have both health benefits and side effects, especially on the stomach and the nervous and cardiovascular systems. The side effects are temporary and cease once consumption is discontinued. Still, some people are more sensitive than others to the effects of certain compounds in chocolate, which makes them more likely to experience side effects such as stomach upset, insomnia, palpitations or extrasystoles. 1) Worsens gastritis. Chocolate irritates the stomach lining causing symptoms such as stomach upset, abdominal pain and other side effects that may derive from the stomach upset such as a general feeling of unwell, heartburn, palpitations, sweating, nausea etc. For gastritis sufferers whose stomach lining is already irritated by gastric juices, eating chocolate adds to the irritation and can worsen the condition. Dark chocolate with 70% or more cocoa content causes the worst inflammation of the stomach lining. Experts recommend to avoid eating chocolate in any form if you currently have or are trying to recover from gastritis or peptic ulcer. 2) Bad for acid reflux. Because of its irritating effect on the stomach lining, chocolate encourages the escape of gastric juices into the esophagus and exacerbates gastroesophageal reflux symptoms. The gastric juices irritate and cause inflammation of the esophagus which leads to symptoms such as heartburn, a strong burning sensation in the chest. Profuse sweating, nausea, feeling sick to the stomach, palpitations and other symptoms may occur, depending on how severe the acid reflux is. 3) Causes insomnia, agitation, headaches, trembling. Chocolate is food for the brain. Antioxidants, dietary minerals, vitamins, fatty acids and other elements with nutritional value in chocolate nourish the brain and the nervous system and, together with other natural chemicals, alter brain chemistry, regulating mood and various brain functions (read more about the benefits of eating chocolate). Caffeine and theophylline are one of these special compounds in chocolate with a direct and positive action on the nervous system. But while they make us more alert by stimulating wakefulness, they can also have side effects. For example, eating chocolate at night or simply too much chocolate during the day can cause insomnia and agitation as a result of its caffeine content. The theophylline in chocolate also stimulates the central nervous system and the cardiovascular system and may cause side effects such as irritability, headaches, nausea, lightheadedness and especially insomnia. 4) Chocolate causes extrasystoles. Certain elements in chocolate that alter brain chemistry have both benefits and side effects. For example, caffeine and theophylline both have effects on the cardiovascular system and can cause extrasystoles, a form of arrhythmia characterized as a skipped heartbeat or a premature heartbeat. In most cases, extrasystoles are a harmless condition and are brought on by factors such as stress, drinking coffee, green tea or fizzy drinks, eating cocoa-rich chocolate etc. 5) Causes heart palpitations. Eating too much chocolate, especially if it’s rich in cocoa, can lead to heart palpitations, irregular, fast heartbeats. Some people also report experiencing profuse sweating, lightheadedness, shaking and a sort of weakness coming from the chest along with (or as a result of) the palpitations. 6) Arrhythmia. Chocolate, especially with a high content of cocoa, stimulates both the cardiovascular and the nervous system and can cause cardiac arrhythmia, or abnormal heart rate. Caffeine, theophylline and theobromine are the three elements in chocolate that cause arrhythmia. In addition to altering normal heart rhythm, they can also lead to tremors, insomnia, agitation, anxiety, headaches etc. 7) Acne. For some people, eating chocolate causes acne or can worsen the existing condition. However, different studies pinpoint different triggers so researchers cannot say with certainty if it’s the cocoa solids, cocoa butter, milk, sugar or other elements like soy (known for its estrogenic effects) that are responsible for such an effect. Conclusion. The reason why chocolate is bad for you has to do with how you respond to the different elements in its composition. It’s an individual response, which explains why it’s so good for some people, but bad for others. Either way, what matters is if chocolate is good or bad for you, not others. If you experience side effects after eating it, then it’s bad for your health and maybe you should consider other foods. Because the fact that it’s good for others won’t make it good for you too. So is chocolate good or bad? I can’t tell. It’s both and the effects are different for each person. For example, if you have gastritis, eating chocolate could irritate your stomach and make your gastritis worse. The darker the chocolate, the stronger its effects. At the same time, you would be enjoying its antioxidant benefits. In this case, eating chocolate would be both good and bad for you. If you have insomnia and don’t sleep well at night, then it’s not good for you to eat any kind of chocolate because it stimulates the nervous system and keeps you awake. But if you need more brain power and energy, then it might help to eat some chocolate. In this case, chocolate can be either good or bad for you, depending on the circumstances. Sometimes, your body changes and you react differently to foods over time. For example, if you have suffered from a gastritis in the past, you might not have been able to eat chocolate. But if you are healed now and have a clean diet, then maybe a little chocolate won’t upset your stomach. And it’s also about cocoa content: the higher the cocoa content, the darker the chocolate and the stronger its effects, whatever they may be for you. The lower the cocoa content, the lighter the chocolate and the less pregnant its health effects. Also, chocolate low in cocoa may contain extra cocoa butter or sugar or milk, so you have to see how you react to more of these ingredients when trying to assess if it’s good for you or not. Overall, you have to consider your own health first and see how the compounds in chocolate may affect any existing medical conditions. Based on this you can figure out if eating chocolate is good or bad for your health. And always eat in moderation because excesses are never healthy. In any case, nobody should eat foods that are in any way bad for them. If you experience any side effects after eating a certain food, then it might be best to avoid it altogether and look for another food with similar nutritional value and properties to give you the benefits you are looking for without the side effects. But if you can eat chocolate and feel great after, no side effects, then you can continue to eat it since it’s good for you. Does this answer help, Jacinta? If you have more questions about chocolate, feel free to ask. Wishing you lots of health. When I gorge on chocolate I seem to go down with a virus, I’m guessing this is because of the sugar? Hello, Wendy. 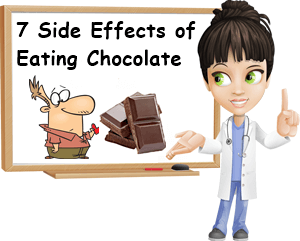 Do you experience side effects after eating any type of chocolate or a particular chocolate like dark chocolate or milk chocolate? And can you please tell me what kind of side effects do you experience more exactly and how long after eating chocolate do they occur? Because there could be a number of compounds that may be bad for you. It could be lactose intolerance from the milk in milk chocolate. It could be a side effect of sorbitol, a sweetener with laxative properties found in some diet candy and food products or sugar. You could have an allergy to chocolate which, although rare, is possible. Symptoms of chocolate allergy may range from throat itching, tongue swelling, wheezing, skin rashes to tongue and throat swelling and closing up, laryngospasms, burning sensation in the lungs, overall difficulty breathing and, in serious cases, anaphylactic shock. Digestive upset such as bloating, gas, burping, stomach heaviness, abdominal cramps, loose stools or diarrhea, nausea and vomiting are also possible. Allergy to peanuts, walnuts, almonds and other nuts or seeds in chocolate is also possible. 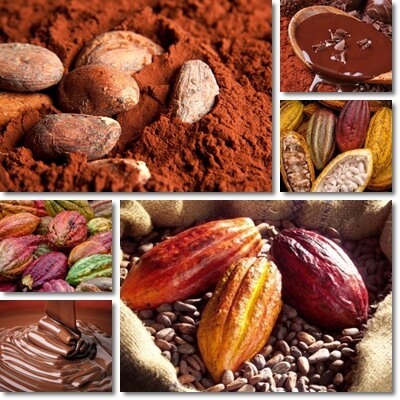 You could also be experiencing a sensitivity or intolerance to cocoa or other compounds in it. Although usually a lot less severe than chocolate allergy, it can cause bloating, gas, diarrhea or constipation, general stomach upset, hives or acne. What you may be experiencing could be an adverse reaction to caffeine or theobromine in cocoa. These two compounds often cause nervous system and cardiovascular side effects such as insomnia or disturbed sleep, agitation, a feeling of apprehension, anxiety, mood changes, irritability, fast heartbeat or fast heart rate (tachycardia), arrhythmia, extrasystoles, palpitations and other symptoms. Lastly, it’s not uncommon to feels sick after eating chocolate due to some higher amounts of heavy metals in cocoa. Some types may have more lead, cadmium, nickle, aluminum, arsenic. Even a higher zinc content in cocoa and the chocolate made from it can cause one to feel sick to the stomach, experience nausea or vomiting sensation or stomach upset. The more chocolate you eat, especially if it’s the same one, the more likely you are to experience a particular set of adverse reactions. I ate 2 chocolate bars and 1 Easter egg on the same day. This was milk chocolate. I do love chocolate but it worries me that on this particular day I ate too much and that it may be detrimental to my health. Can you reassure me on this concern. Thank you. Hello, Timothy. Did you feel sick to the stomach after eating the chocolate? Did you experience nausea or palpitations or skin rashes or any other symptoms? Because if you felt fine, then you are likely alright and don’t have any reason to worry. Just make sure you don’t overeat in the future. Just like one super healthy food won’t make up for a whole bad diet, so one food eaten in excess one time won’t ruin an overall good diet. So if you felt okay and continue to, then try to focus on the future and avoid dietary excesses from now on. Hope this helps and if you have any more concerns, I’d be happy to help with anything that I can. Wishing you lots of health, Timothy! Hello, Jessa Irene. If by severe health problems you are referring to palpitations, extrasystoles and arrhythmia in general, then yes, dark chocolate can cause and worsen such cardiovascular experiences. The good thing though is they are temporary and discontinuing consumption can help reverse symptoms. It’s always a good idea to practice moderation with regards to everything you eat. A lot of foods have both benefits and side effects, but you can limit the side effects by limiting your intake to amounts that are right for you and do not elicit adverse reactions. One suggestion would be to change your gym schedule and work out in the morning, before work (if possible). The human body naturally secretes cortisol early in the morning, which should help with the tiredness. The last cortisol of the day is produced around 5 pm, so it’s natural to feel too tired for the gym after work. You could choose a dark chocolate with a lower cocoa content (55% cocoa instead of 75% or 90%). This way you can reduce your intake of caffeine and theobromine from the cocoa and maybe experience less palpitations. It may help to skip coffee altogether the days you go to the gym and only get your caffeine from the dark chocolate you eat. And my go-to for palpitations and arrhythmya in general: magnesium and potassium supplements. They really do wonders for the cardiovascular system. Although they won’t make up for eating too much chocolate and you’d still have to at least cut back on your intake, choose a chocolate with a lower cocoa content, discontinue consumption for a while etc. Do you consume other foods or beverages with energizing properties? Like green tea, for example? Really hope this helps and wishing you lots of health, JessaIrene.